The answer used to be simple. There was a single service for compute, storage, and a few others services in early trials. Fast forward 10+ years and AWS now offers over 50 services. Taking your first steps can be daunting. What follows is my recommended approach if you’re starting fresh in the AWS Cloud and don’t have a lot of legacy applications and deployments weighing you down. If that is you, check out the companion post to this one. This directs your service choice as you start to build in the AWS Cloud. You want to pick more and more of the services that fall under the SaaS or abstract — which is a more accurate term when compared to SaaS — category. If you need to run your own code as part of your application, you should be making your choice based on doing less work. This means starting with AWS Lambda, a service that runs your functions directly without worrying about the underlying frameworks or operating system. If Lambda doesn’t meet your needs, try using a Docker container running on the Amazon EC2 Container Service (ECS). The advantage of this service is that it configures the underlying EC2 instance (the OS, Docker host, scheduling, etc.) 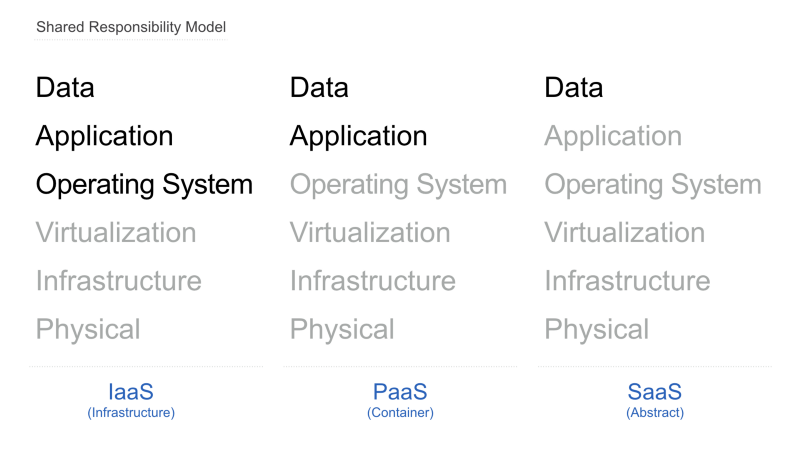 and lets you simply worry about the application container. If ECS can’t meet your needs, see if you’re a fit for AWS Elastic Beanstalk. This is a service that takes care of provisioning, capacity management, and application health for you (a/k/a you do less work). All of this runs on top of Amazon EC2. So does Lambda and ECS for that matter. If all else fails, it’s time to deploy your own instances directly in Ec2. The reason you should try to avoid this as much as possible is the simple fact that you’re responsible for the management of the operating system, any applications your install, and — as always — your data. This means you need to keep on top of patching your systems, hardening them, and configuring them to suit your needs. The best approach here is to automate as much of this operational work as possible (see our theme of “do less” repeating?). AWS offers a number of services and features to help in this area as well (start with EC2 AMIs, AWS CodeDeploy, AWS CodePipeline, and AWS OpsWorks). When it comes to storing your data, the same principle applies; do less. Try to store you data in services like Amazon DynamoDB because the entire underlying infrastructure is abstracted away for you. You get to focus purely on your data. If you just need to store simple file object, Amazon S3 is the place to be. In concert with Amazon Glacier (long term storage), you get the simplest version of storage possible. Just add an object (key) to a bucket and you’re all set. Under the covers, AWS manages all of the moving parts in order to get you 11 9’s of durability. This means that about 0.000000001% of objects stored in the service may experience data corruption. That’s a level of quality that your simply cannot get on your own. If you need more control or custom configurations, other services like the Amazon Elastic File System or EBS volumes in EC2 are available. Each of these technologies comes with more operational overhead. That’s the price you pay for customization. In addition, all of the talks from previous Summits (one to two day free events) and AWS re:Invent (the major user conference) are available for viewing on the AWS YouTube channel. There are days and days of content for you to watch.